A citrus based jam incorporating finely shredded pieces of rind, marmalade has the distinct advantage that it can be made throughout the year, since citrus fruit and canned orange pulp is available at any time. It is worth noting, though, that marmalade tends to have a far longer cooking time than most jams, with more water being used to compensate for additional evaporation. Seville oranges, arguably the finest fruit for marmalade recipes, are actually quite seasonal and only make an appearance on supermarket shelves during the months of December, January and February. However, if you are planning to make Seville orange marmalade later in the year, then these oranges can actually be frozen quite successfully, for use on a future date. 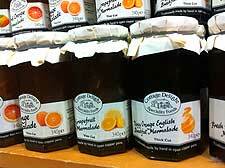 In general, bitter oranges make the best marmalades and you should only used sweet oranges when the recipe includes other more sour citrus fruit, such as lemons and grapefruit. 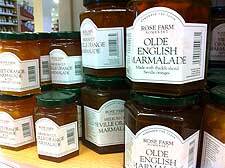 The list below is a very diverse collection of marmalade recipes. Some will involve straining the citrus mixture to create a jelly like jam, before incorporating the shredded rind, while others involve the addition of apples, to help make a thicker mixture. If you are short of time and would like to speed things up a little, then you can initially cook the fruit in a pressure cooker, in a fraction of the overall time.